Teamwork is essential to getting things done, especially when bringing new technology into a school or district. In today’s digital world with more complex challenges, it's important to bring energetic champions to the table who are committed to preparing students for success in school and in life. This is exactly the frame of mind Adams 12 Five Star School District in Thornton, Colorado, fostered when it partnered with Naviance to enhance its college and career readiness efforts. Like many districts across the United States, Adams 12 was faced with meeting a Colorado state mandate requiring students to create and manage an Individual Career & Academic Plan (ICAP). The district turned to Naviance to streamline its counseling processes and bring all the pieces of an effective ICAP program together in one place. Since implementing Naviance in 2010, the district increased its graduation rate by 12 percent, and data collected through Naviance helped the district justify spending to restore counseling positions that had been lost due to budget cuts. Adams 12 credits its success to its commitment to collective responsibility and teamwork. As part of its implementation process, the district developed a high school Naviance ad hoc committee to align the Naviance efforts across the district and ensure all counselors were properly trained on the system. Decisions are made collectively, helping the team move forward to reach its goals. 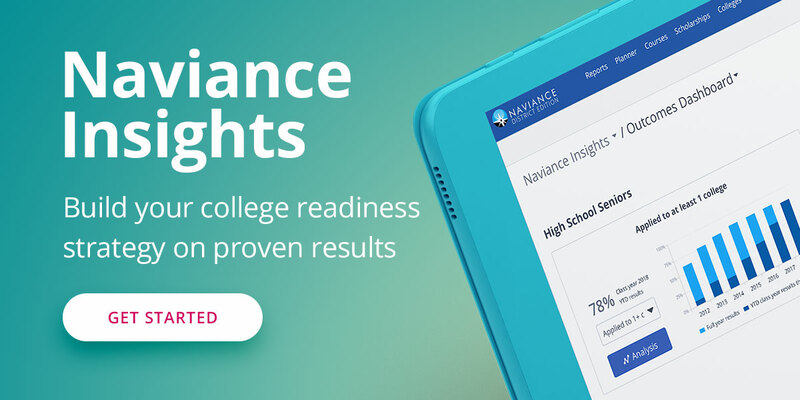 To learn more about Adams 12 and their experience with Naviance, download our success story.